A new multi-family condominium development has broken ground just east of downtown, the Austin Business Journal reports. The Tyndall, located on the northbound side of IH-35 at 8th street, will have 182 residences for sale, and already 32 of those units are under contract. The development is on track to be completed in August 2018 and will have 23,000 square feet of amenities including a rooftop pool and deck with amazing city views, climate controlled bike storage, a 24 hour fitness center, yoga lawn, and firepit grotto with intimate seating. The project will have some of the lowest housing costs in the downtown area, with prices around $200 per square foot, compared to $700 per square foot for most downtown developments. A 571 square foot unit starts at $260,000 and the largest units, which are 2,800 square feet, will go for about $1 million. The goal of the developers was to bring a high quality of life to people for less money. Residents will be able to commute to downtown for work and play in minutes and also be within walking or biking distance of landmarks like Franklin’s barbecue, Cisco’s, Waller Creek, and the UT Medical School. The designer of the Tyndall also designed Uchi, Uchiko, and the Alamo Drafthouse Cinema. 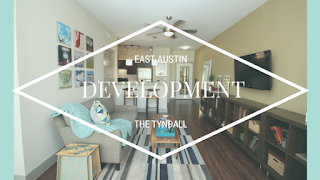 If you’re looking to rent in the area of East Austin near downtown, there are many apartments for the rental lifestyle as well. The studio, one and two bedroom apartments at Eleven by Windsor have ten foot ceilings, espresso or white custom cabinets with brushed nickel hardware, granite counters, oversized energy efficient windows, and wood or polished concrete floors. The community has a skylounge with indoor/outdoor areas and downtown and Capitol views, a fully equipped bicycle repair workshop and bike storage, a shaded dog park and pet grooming station, and so much more! Amli Eastside has studio, one, two, and three bedroom apartments equipped with gourmet kitchens with granite counters, deluxe cabinets, and undercabinet lighting, full size washers and dryers, tile entries and faux wood floors, large walk-in closets, nine foot ceilings, and spa-like bathrooms with marble countertops. Amenities include a resort-style pool with cascading waterfall, gourmet coffee bar, garage parking with direct access at every level and reserved parking available, and an outdoor deck with poolside bar. Corazon is within walking distance to eastside dining and nightlife, has retail and dining on the ground floor, valet trash service, a rooftop deck with downtown skyline views, and is a LEED Certified Gold building. Apartments, which are available in studio, one and two bedroom floorplans, have concrete or wood style flooring, granite counters and tile backsplashes, butcher block kitchen islands, included washer and dryer, oversized energy efficient windows, and use low VOC paints and finishes. Eastside Station’s studio, one, and two bedroom apartments feature nine foot ceilings, hardwood style flooring, 42” cabinets, deep kitchen sinks with gooseneck faucets, granite counters, stainless steel appliances, included washers and dryers, large walk-in closets and live/work units are available. The community has a fitness center with spin room, a parking garage, bike storage, a fire pit, a rooftop lounge, elevator access and is a gated community. Ready to make your home on the eastside? Give Austin Apartment Specialists a call today at 512-241-1111. We love what we do and we’d love to find the perfect apartment for you!